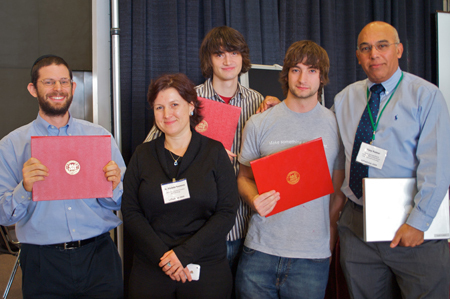 The 2009 Ed Tech Fair enjoyed a huge turnout, with over 25 presenters and exhibitors, a lively panel discussion featuring four MIT professors doing pioneering work in visualization and simulation, and the student winners of the iCampus prize demonstrating their winning projects. Each exhibit or featured project at the Ed Tech Fair had its own detailed 'snapshot', including a desciption of its pedagogical goals, an outline of any resulting outcomes, and an explanation of relevance to specific learning areas. Click here to enter the Exhibits Overview. 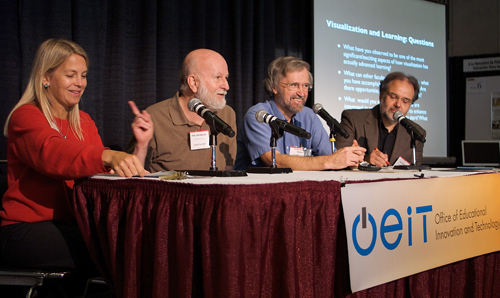 Professors Dava Newman, John Belcher, Graham Walker, and Kurt Fendt shared how the use of visualizations and simulations has made learning more effective and meaningful. Tools are integrated into the classroom experience, as well used for supplementary study. A video of the panel discussion is available below. iCampus winners Chris Varenhorst '09 and Justin Cannon '08 demonstrated their Lingt Language website, an interactive tool for language learning. Second place winner Sacha Zyto 'G demonstrated his PDF Communal Annotation Site. Drs. Kumar and Ivanova administered the prize competition and presented awards to the winners. The range and depth of educational innovation at MIT was demonstrated by projects that promote collaboration across departments and schools, projects that find and incorporate digital content in meaningful ways in research and learning, and projects that feature open educational tools and resources. 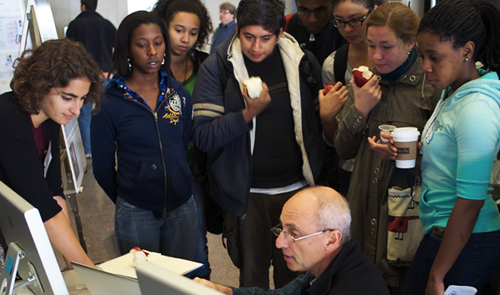 Attendees to the fair included interested individuals across MIT's demographic: faculty interested emerging technology-enabled initiatives, undergraduates absorbing new perspectives on educational innovation, and technologists and researchers looking for grist and inspiration. If you attended the fair, please let us know your thoughts and reflections. Register with this site, below, and add your comments. We want to hear from you!